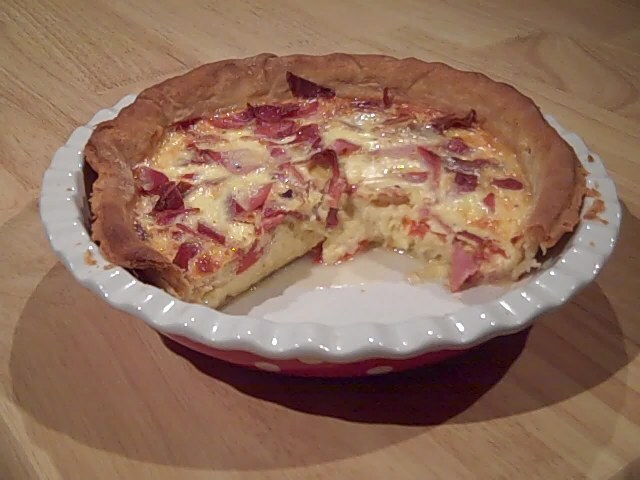 Easy cheese and bacon quiche, choose between homemade pastry or a quick shop-bought version. I used the shop-bought. Roll out the pastry on a light floured surface and line a 22cm/8½inch flan dish. Don’t cut off the edges of the pastry yet. Chill. Pre heat the oven to 190C/gas 5. Remove the pastry case from the fridge, prick the pastry all over with a fork and line the base of the pastry with baking parchment and then fill it with baking beans (dried pasta will work just as well if you don’t have baking beans). Place on a baking tray and bake blind for 20 minutes. Remove the beans (pasta) and parchment and return to the oven for another five minutes to cook the base. Reduce the temperature of the oven to 160C/gas 3. Sprinkle the cheese into the pastry base and add the sliced tomatoes if you are using them. Fry the bacon pieces until crisp and sprinkle over them over the top. Whisk together the eggs, milk and cream in a bowl and season well. Pour over the bacon and cheese. Trim the edges of the pastry. To freeze the quiche: Allow to cool completely, then wrap in cling film. Freeze for up to 3 months. Reheat from frozen, in a preheated oven, for 15-20 minutes, or until piping hot throughout.